After a practice run in the water, Mike Keliipuleole explained a contraption that he created and developed. It is a “truck shower,” in the back of the bed of his totally rubberized 90’s Chevy truck! Its purpose is to make showering-off after paddling a little easier. Keliipuleole is always on a tight schedule, whether he is in the water working out, or doing his work on the water. He hails from an ohana of paddlers and watermen. 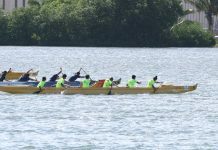 His dad is the late Irwin Kelliipuleole, head coach of the Koa Kai Canoe Club. At the tender age of four, the elder Keliipuleole put him in a canoe. Since that time, Mike explains, “I took a long break that lasted through my teens into my early twenties.” His return came after a long time away from paddling. He played the typical “round ball sports,” including baseball, football and basketball. Mike is a captain for Sause Brothers Ocean Towing Company, based in Honolulu Harbor. Prior to becoming a captain, Keliipuleole attended college for two years, directly after high school. He also worked as a captain for a sport fishing charter out of Kewalo Basin, aboard his family’s boat the Melekai, as well as a bartender on the Star of Honolulu. He remarked on his very unique career, “If you seriously want to pursue a career as a Merchant Mariner, I would suggest attend-ing a maritime academy. There are several on the West Coast, and a lot more on the East Coast. There are endless opportunities available in both the wheelhouse and engine-room side of a vessel, as well as logistics and shore-side careers. SPEED BOAT vs OUTRIGGER CANOE?